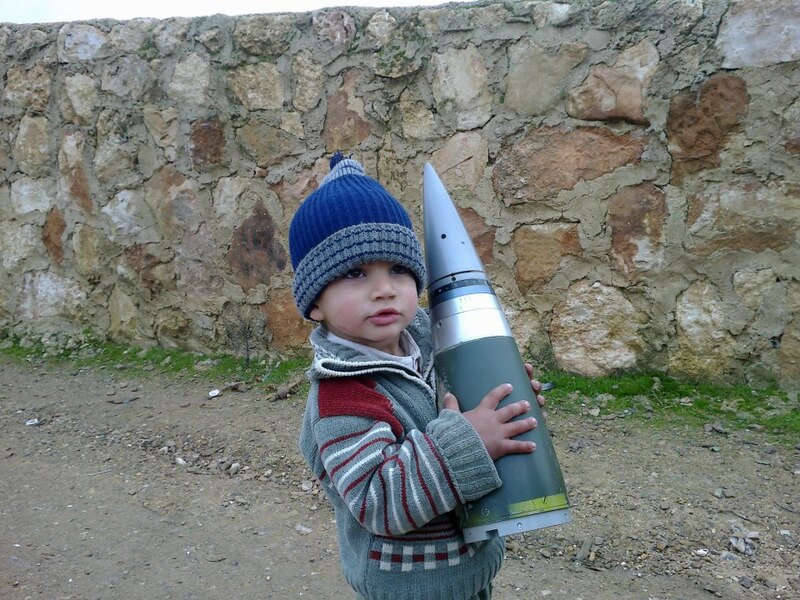 Recently, Sakr 122mm cargo rockets and their submunitions have been observed within Syria. This family of 122mm rockets is designed for use with the Russian BM-21 multiple rocket launcher (the so-called ‘Grad’, or ‘hail’) and other 122mm systems such as the Chinese Type 81 SPRL and Egyptian RL-21 and RC-21 launch vehicles. These surface-to-surface multiple rocket launcher systems are not designed for precise fires, but instead target wide areas; this effect is, of course, even more pronounced when firing submunition-dispensing rockets from these systems. Despite multiple reports to the contrary, these munitions are not Iranian, but were produced in Egypt at the Sakr Factory for Development Industries, a subsidiary of the Egyptian Arab Organization for Industrialization (AOI). The AOI logo can be seen very clearly on the rocket in the video below, and the full name along with ‘Sakr Factory’ can be seen printed on the rockets in Arabic in the images at the bottom of this article. Sakr 122mm rockets are produced with high explosive (HE), leaflet, or submunition payloads. It is also believed that mine-dispensing and illumination varieties have been manufactured. Sakr 122mm rockets have been produced in four lengths, with designations of Sakr-10, Sakr-18, Sakr-36, and Sakr-45, for their approximate ranges. In reality, the maximum range varies depending on the payload of the rocket. Cargo rockets are produced in the -18, -36, and -45 varieties, with effective ranges of 17, 31, and 42 kilometres, respectively. The Sakr-10 and Sakr-18 models feature ‘S-form’ folding fins (as seen on the Soviet/Russian 9M22U and other 122mm rockets), whilst the Sakr-36 and Sakr-45 feature straight fins, as seen in the video above. Whilst the video description claims there were ‘over 100 bomb[lets]’, this is unlikely. Sakr-18 and Sakr-45 rockets contain 72 submunitions each, whilst Sakr-36 rockets contain 98. A mechanical time fuze causes the submunitions to eject from the carrier rocket (believed to occur at approximately 700m above ground, in the case of the Sakr series rockets). The fuze and rocket nose cone can be seen in the image below (credit). Whilst information on the submunitions themselves is scarce, it appears that early rockets were loaded with Soviet and Chinese submunitions, including Chinese Dual-Purpose Improved Conventional Munitions (DPICM) derived from US designs. Later rockets, including those in current production, are loaded with copies of the US M77 submunition; these are probably Egyptian-produced copies, although some may have been manufactured in China. Some western sources refer to this later submunition as an ‘M42D’, though it is unclear where this designation originates (other than the obvious allusion to the US M42 submunition). It is not clear whether this is an internal designation, or a term applied by an observer at a later date. The submunitions observed appear to be copies of the US M77 submunition, rather than the M42, and feature the wider ribbon necessary to arm the munition when released from a cargo rocket. The bomblets pictures are one of two confirmed submunitions known to be used with Sakr 122mm rockets, and are sometimes referred to simply as the ‘Sakr Type B’ submunition. Both the ‘Type A’ and ‘Type B’ appear to be copies of the US M77. I worked for several years cleaning up after firings of the US MLRS with the M77; we had the utmost respect for the sensitivity of the detonator. If the wind reached 6 knots at ground level we would depart the range area, any movement of the ribbon on dud munitions could potentially cause detonation. Normally we could not just quit for the day, so we would retreat to our safe zone to play cards and wait to see if the wind died down. On numerous occasions while waiting we would have detonations within the area from wind disturbance. 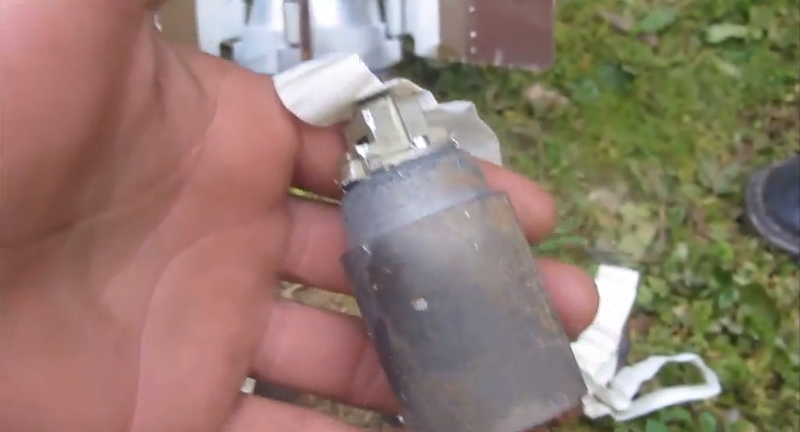 The submunitions seen in the video above appear, in most cases, to have failed to arm. 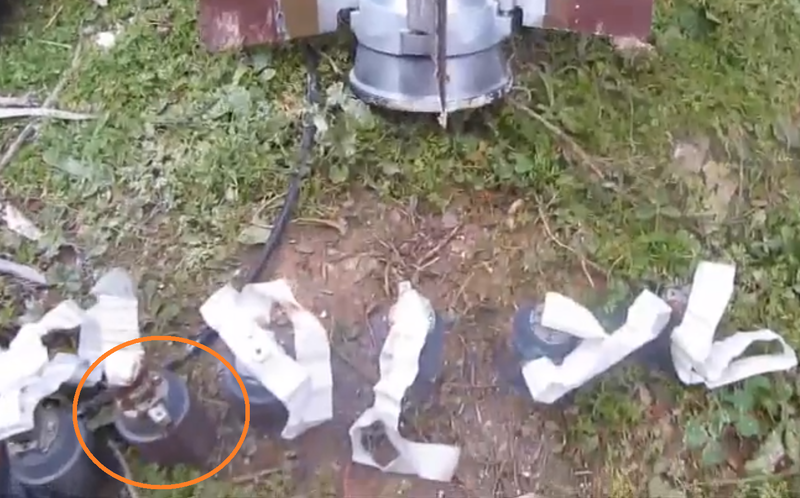 However, towards the end of the video a submunition with an armed fuze can be seen (circled in image below). This is extremely dangerous to move, handle, or approach. Should any readers have further information on the submunitions used with Sakr 122mm rockets, or new photos or footage of such rockets or submunitions, please get in touch. My thanks to Jeff Osborne, Michael Weber, Peter White, Neil Marshall, and Travis Owen for their assistance with this piece. This series of photos was taken by Nicole Tung, a professional photographer, in Jebel al-Zawiyah. Note the markings, submunition characteristics, and fragmentation matrix. I cringed and leaned away from the screen when he picked that submunition up; seen too many poor handling procedures go awry I guess.